Chester Park is only a little small park in our city, but gets LOTS of use. Mainly because of the famous "Al and Alma's Supper Club and Dinner Cruises". 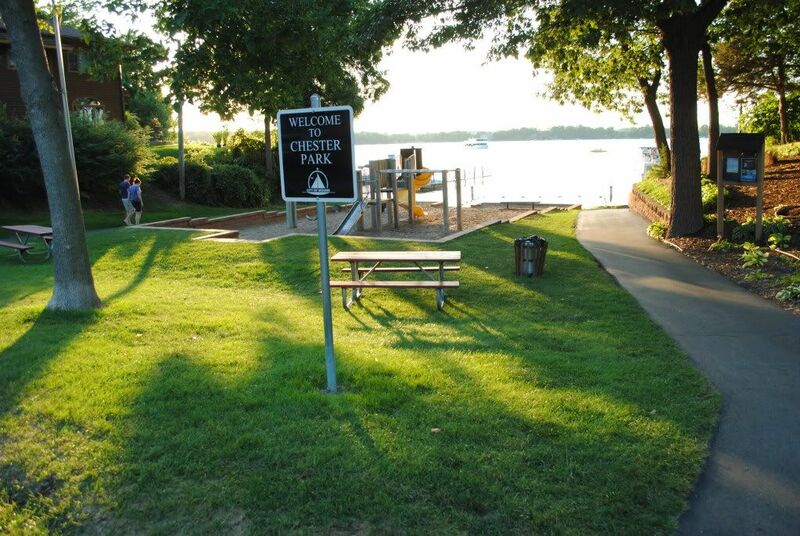 This is a very quaint park, with a small beach on Cooks Bay, a small playground, and access to Al and Alma's docks, and some public docks. Al and Almas, Piper Rd going to the right. No on street parking here, it's right off the infamous 'no parking allowed' Tuxedo Blvd and Piper Rd. Piper Rd is a road that was designed for days when it was just cabins, and is very narrow. On street parking would be very impracticable here. I imagine Al and Alma's wouldn't mind if you parked in their lot. This park is clearly being used often, though I imagine most of its users are customer's of Al and Almas, though I'm sure neighboring residents take advantage of it. This is a park that enhances the neighborhood, including an important local business, definintely a "Place in Mound." 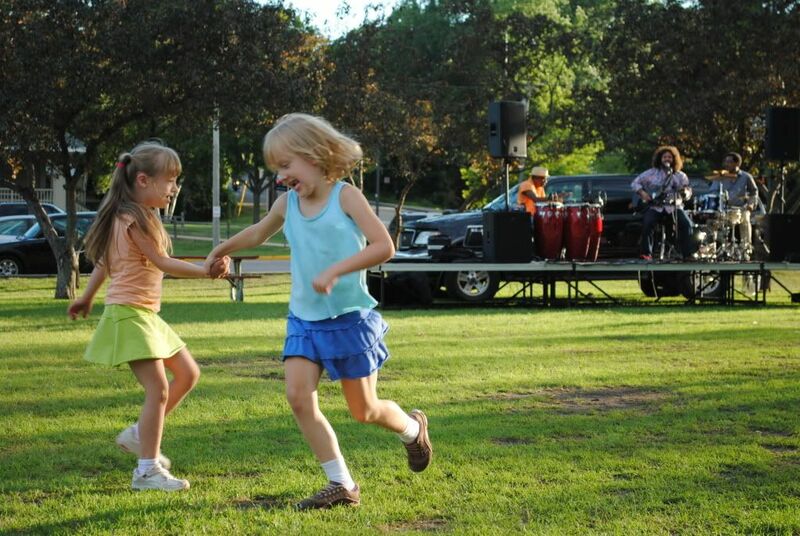 Here's a great example why Surfside Park is THE park in Mound, MN. The evening of the terrible shootings in Aurora, CO, a young local gentleman in grief needed to connect with people instead of sitting at home, watching the news. As we said before, Surfside has a lot of great things going for it... including it's highly visible location, it's amenities, and the lake. But what if you were late for a spontaneous event like this? Would you still go? The City of Mound can make this a better place, a more accessible place, if on street parking were allowed. One thing that makes for good places in Mound is the need for good connections. 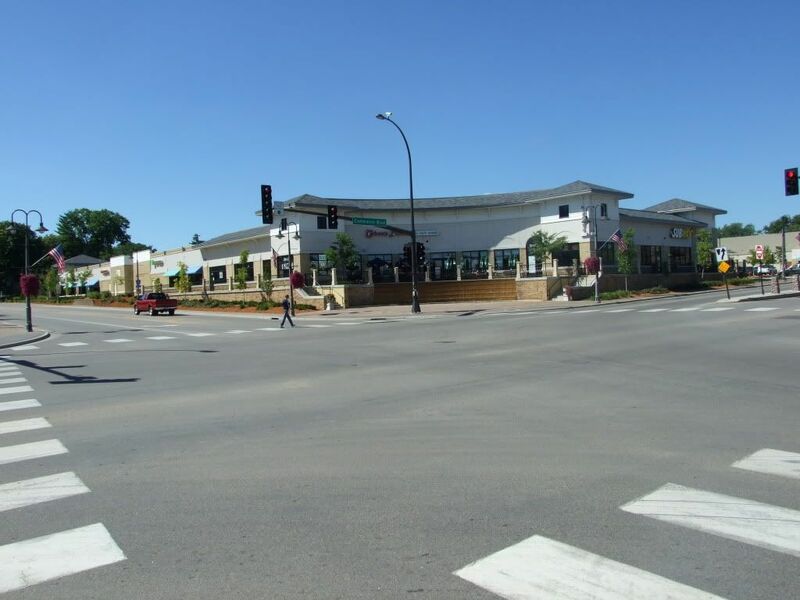 David Greenslit at the Mound-Westonka Blog had noted recently that biking though the Lynwood/Commerce intersection is not a pleasant experience. He's been blogging a lot about biking in Mound. Lynwood and Commerce... a place for cars. 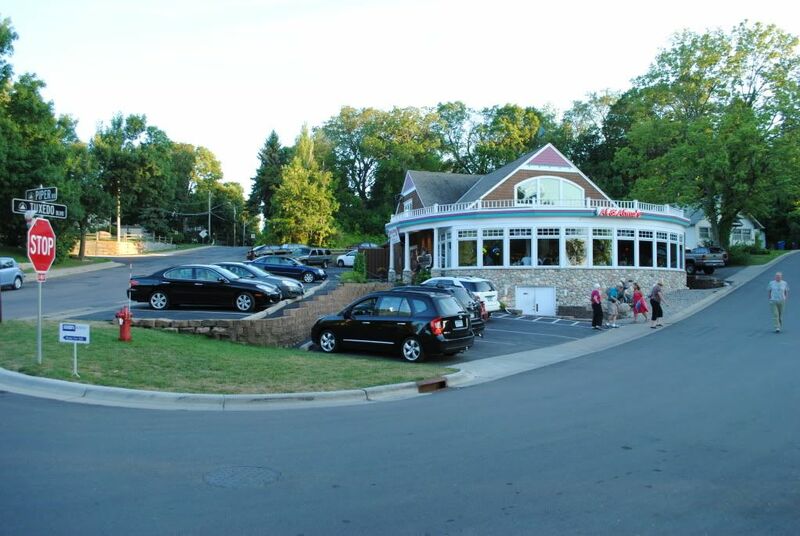 The Dakota Trail brings through many bikers and pedestrians through town, but what do they do if they want to stop and enjoy a place in Mound like grabbing a bite to eat, or grab a drink? Unless they head to Caribou or Porta Del Sol, they would have to probably deal with Lynwood and Commerce Blvd. A place where bikes 'should' be in the left lane, leaving the sidewalk to pedestrians... but most bikes end up on the sidewalk because all the vehicles make it very uncomfortable. This new intersection, bringing together two county roads, while great for getting cars though quickly and easily, is barely tolerable for the rest of us. WALK/DON'T WALK lights don't give preference to pedestrians. And unless you are walking to Carbones, or True Value, you need to walk at least the length of a large building to get to your destination. This will be true even with the new Walgreens. As Mound continues to develope it's downtown along Audtiors Rd, what kind of intersections will it have to Lynwood and Commerce? Are they going to be like Lynwood and Commerce with stop lights? 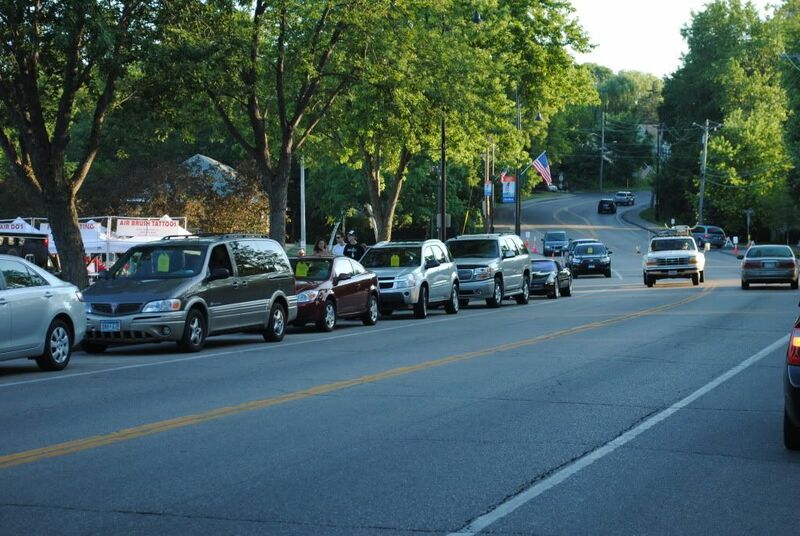 Downtown Excelsior intersection, a place for everyone? Here is a friendlier place for pedestrians and bikers, while cars can still get through. Stores have doors near the intersection, on street parking slows down traffic. Stop signs means pedestrians don't have a long wait to cross the street. Can Mound have an intersection like this as it developes Auditor's Rd? Commerce and Auditor's Rd - Will this be a Place in Mound? Here's a chance where you can make your own neighborhood "A Place in Mound!" 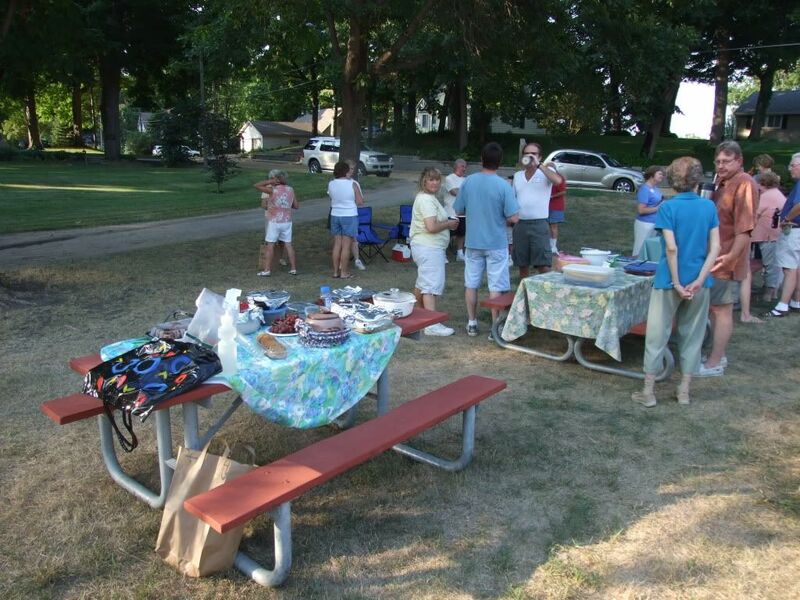 A Mound neighborhood park on national night out in 2007. Most people are aware of the annual neighborhood get together, but many usually totally miss out because they didn't hear about it, or don't think anything is happening anyway, which is a shame. Plan now, and see what's happening on your street. If nothing is happening, do it yourself! The city of Mound has a flyer with info if you want a squad car to visit for the kids to checkout. Then pull your grill out into the front yard or a nearby park or commons area, grab a pack of hot dogs and brats, and start a party! It's those kinds of things that make great neighborhoods, which are our most important places! Auditors Rd/Greenway, a place waiting for something to happen! I know many of you share my feelings of frustration when we drive by Auditors Rd. Seeing that big empty field that is meant to be full of new downtown shops, residences and places makes my heart ache. But when something special happens, like the Mound Farmer Market on this stretch, I always get a big smile. Then on Saturday mornings we get this tantalizing taste of what the potential will be when something is actually built here. People come on purpose to get produce, or some come by happenstance and find treasures for themselves and others. There are smiles, waves, and handshakes all around as people come together at this place. I imagine there is some frustration for the current businesses on Commerce, who see all that wonderful traffic so close to their own businesses, yet separated less than a hundred feet, and some visual obstacles like Crow River Bank and Mound True Value. A successful Mound Farmers Market means that people will see Mound as a destination not only for consumers with cash, but local businesses looking to build and expand. See you Saturday at the Farmers Market! One of the things that Mound needs to have places people will go to. As much as folks mope and complain about nothing happening at Auditor's Rd, and a lack of shopping and eating options, we need to focus, and build on the positive things that are happening now in Mound. In my mind, the place where some of the best community events happen is Surfside Park and Beach (formerly Mound Bay Park). One of the downsides of this park is the limited parking options. Once the parking lots are full, people are forced to drive two blocks away and park on a street which is not necessarily better for park users. Suddenly last week, during the centennial celebrations, event staff and vendors were allowed to park on the street next to Surfside. Here is a slideshow showing why street parking should be allowed at Surfside. Please follow this blog if you want Mound to be a place to drive to, not a place to drive through. Why not allow parking here all the time? This is Bartlett Blvd next to Surfside Park and Beach. I've been advocating to the city to ease of the 'No Parking' restrictions here with considerable frustration. Then suddenly last week, during the Centennial Celebrations, they allowed some vendor's and event staff to park here. This needs to be allowed again for more events, or even fulltime. Join us as we make Mound a place to drive to, not a place to drive through. 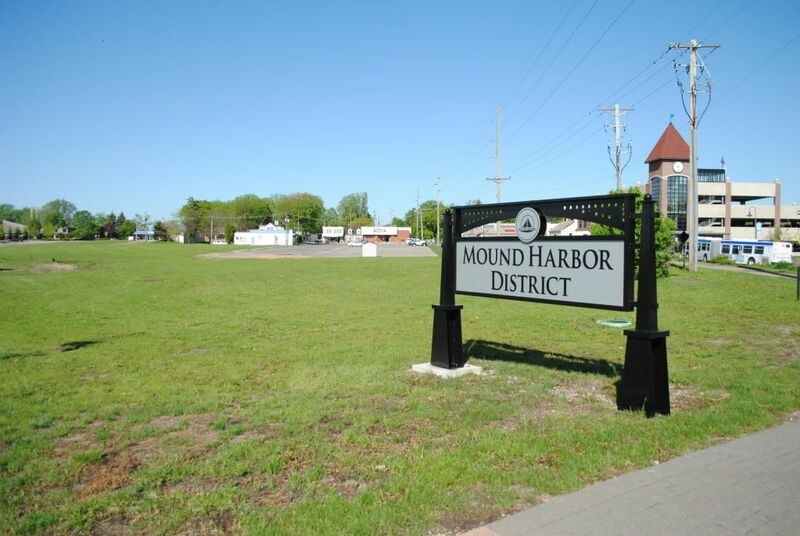 Creating a group of citizens who are interested in making Mound a better place for everyone. We will be focused on creating places in Mound where we can connect, play, and support each other. We will strive to improve places that are important like our parks, schools, streets, and businesses through better accessibility, safer connections, and highlighting the events and festivities that already make Mound a great town.